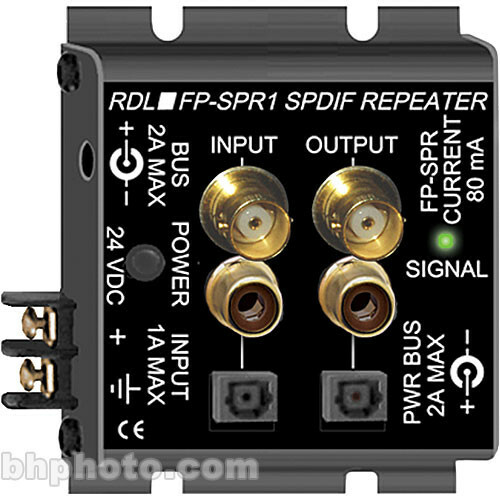 The FP-SPR1 SPDIF Repeater and Amplifier from RDL is a single-channel module designed to perform conversion between BNC, phono, and optical SPDIF connector types. Only one of the three outputs or a combination of the coaxial and optical outputs may be used simultaneously. A front-panel LED indicates the status of input and output signals. Power connections are made via a full-size barrier block terminal or a DC power jack located on the first end panel. A second DC power jack is included on the second end panel to allow the connection of additional FLAT-PAK modules (sold separately). This device performs conversion between SPDIF connector types and recovery of low SPDIF signal levels. An input and output for each conventional SPDIF format is included: BNC, phono, and optical. The front-panel includes an LED that indicates the status of input and output signals. This unit may be powered via its full-size barrier block terminals or DC power jack. A second DC power jack is included to allow the connection of additional FLAT-PAK modules. Box Dimensions (LxWxH) 4.9 x 4.3 x 2.3"